All new for 2019, Sitka unveils their redesigned Fanatic System which is taking noise control to a whole other level. We hunters spend a great deal of time worrying about scent control in the woods, so isn’t it time we give noise control a little love too? This state-of-the-art hunting system by Sitka Gear was made specifically to reduce fabric noise by cutting the audible engagement distance IN HALF! So, how did Sitka go about making the new Fanatic System so stealthy? Simple, the designers over at Sitka Gear used an ultra-quiet fabric that is both quieter and warmer than any system previously designed. Sitka also boasts the new Fanatic System will give hunters the ability to stay comfortable on-stand/in the field for a longer duration of time, all while providing the confidence of moving more freely without fear of being heard by game animals. 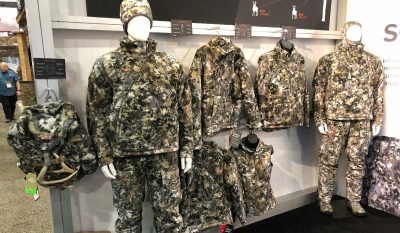 On display at SHOT Show 2019, was the new Fanatic jacket, bibs and pack, all covered with the GORE OPTIFADE Concealment Elevated II camo pattern – this system is tailored towards whitetail hunters, as the Elevated II pattern, if you recall, is scientifically designed to confuse a deer’s vision. Perhaps the most eye-catching feature on the Fanatic Jacket is the unique diagonal zipper options made specifically for left or right handed hunters. The prevention of collecting a ton of burrs was also at the forefront of Sitka’s design when building the new Fanatic System, and Sitka solved it by placing a burr-resistant material in the places that called for it most. The post SHOT Show 2019: Sitka Displays New, Redesigned Fanatic System of Ultra-Quiet Whitetail Gear appeared first on OutdoorHub.